The signature AP24 Whitening Fluoride Toothpaste that you see all over Social Media! This toothpaste brightens and whiten teeth, prevent cavities and dental plaque formation! Purchase AP24 Whitening Toothpaste at distributor wholesale price or customer retail price below. DM to ask if discount is available! U.S.A Click Here! Canada Click Here! Australia Click Here! N.Z. Click Here! Helps remove and prevent plaque buildup. Helps the prevention of dental cavities. Provides a long-lasting smooth, clean, and fresh feel. Features AP-24, an exclusive ingredient. Refreshing, trademark vanilla mint flavor. Use on dry brush. Brush teeth thoroughly, preferably after each meal or at least twice a day, or as directed by a dentist or physician. Children under six years of age, use half a pea size amount and supervised in good brushing and rinsing habits (to minimize swallowing). Other Ingredients: Water (Aqua), Hydrated Silica, Sorbitol, Alumina, Glycerin, Tetrasodium Pyrophosphate, PEG-12, Dimethicone*, Poloxamer 338*, Poloxamer 407*, Cellulose Gum, Sodium Lauryl Sulfate, Flavor (Aroma), Sodium Saccharin, Titanium Dioxide (CI 77891). I love it because does not so much foam like other brands, it taste good. And it truly clean my teeth. I will buy it again soon. Dear Natalia, thanks for your feedback! I use this toothpaste and it does what it says! As a smoker it definitely removed years of nicotine stains from my teeth. One thing to know about this is you should brush dry for 1-2 mins twice a day. It doesn’t contain bleaches or peroxide so your teeth will not get any whiter than they naturally are under the stain. My kids love it because of the sweet vanilla mint flavor. This is now a staple in our house. So great for my sensitive teeth!!! I love that it has no peroxides or bleach in it. Other whitening products hurt my teeth SO bad!! 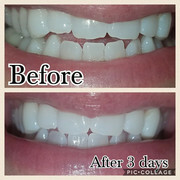 always thought my teeth already white but my after pics prove otherwise! Amazing!! Thanks for your feedback! Absolute fav toothpaste! I’ve tried many different kind including crest whitening toothpaste nothing has worked before this. My parents also got this toothpaste and struggled in the past whitening their teeth. And we all finally have something how much we love it!! 100% worth the money! My teeth were whiter after just one use and continue to whiten with each use. The mint taste is amazing..it’s not too hot of a mint, so it doesn’t burn my mouth, which is hard for me to find in a toothpaste. When I brush in the morning they stay fresh and when I brush at night there’s no build up on my teeth like I had with previous toothpaste. My dentist is amazed at how there is very little plaque on my teeth.Love and recommend to anyone wo wants stain gone from their teeth!!! MUCH MUCH MUCH safer than bleech and peroxide and taste like a white tic tac! To be honest unlike a lot of teeth whiteners on the market, AP24 had a nice minty taste and foamed up well..I’ve been using it for abotu 3 weeks and almost finished the tube but it’s not whitened my teeth at all which is what I bought it for. Love this whitening toothpaste! It leaves my mouth feeling so fresh and clean and it’s like I just came back from the dentist every time I brush. I’m hooked with this toothpaste if you haven’t try yet you need to get some! Don’t expect the results overnight but after using small amount morning and night I noticed a good difference in the first two weeks. Even better after a month. This is an affordable way to keep your teeth white! It worked for me and I do not have sensitive teeth but it did made my teeth sensitive to cold. Glad my sister introduce this to me! It brighten teeth really fast, in just a couple of days. Can’t wait to see more outcome of it at the end! Love it’s for ages 6 and over so my kids can use it. I bought this after reading reviews and seeing before after picture of a friend’s child who had one yellow side tooth. I like that it’s free of bleach and peroxide. You need to apply it to a dry brush. It removes service stains but won’t make your teeth whiter than their natural color. I saw a difference the first time I used it. I’m a coffee drinker. I don’t plan to use it long term but I think if you’re just wanting to remove basic service stains, this is great. I love this toothpaste. It has a great taste and keeps my teeth cleaner longer than regular toothpastes. The only reason I did not give it 5 stars is because my teeth have not gotten super white but have gotten a tad whiter. I am 61 years old so I doubt any toothpaste would give me super white teeth. Dear Ann, thanks for your feedback! AP24 will not whiten beyond your teeth’s natural tone. It whitens your teeth by removing the plaque build up and stains to your natural teeth color, and helps to prevent plaque build up. It does whitens teeth! I’m a heavy coffee drinker and I use this around maybe 3 times per week. It works better than leading brands. I would choose this one and i’m gonna be a repeat buyer. And would recommend this to my family and friends! My hygienist was so impressed with my results she asked for her tube. I had bad pockets in my gums that were 4 and 5s from nursing babies for 3 years in a row lol after a year of being on Ap24 my gums are all in the healthy zone. I love this toothpaste!!! My first to second was 2 weeks and the third pic was at 2 months. Like the product in general. It really helps with my sensitivity! I also have bad stains on my teeth from medicine when i was younger if i dont brush my teeth with this. Will buy this till they stop making it! Much much much more cheaper than buyign from distributor in facebook!